HMC6000A/E diesel engine controller has an expansion CANBUS port that will be connected to a remote control module or expansion digital output module, LED indicator expansion module and security module. 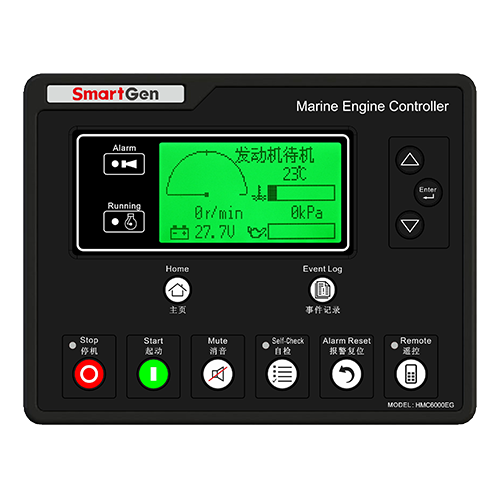 HMC6000A/E diesel engine controller integrates digitization, intelligentization and network technology which are used for genset automation and monitor control system of single unit to achieve automatic start/stop, data measure, alarm protection and “three remote” (remote control, remote measuring and remote communication). It fit with 132*64 liquid display, optional Chinese/English languages interface, and it is reliable and easy to use. The powerful 32-bit ARM processor contained within the module allows for precision parameters measuring, fixed value adjustment, time setting and set value adjusting and etc..Majority parameters can be configured from front panel and can be configured by communication interface via PC. Due to its compact structure, simple connections and high reliability, HMC6000A/E can be widely used in marine emergency engines, main propulsion engines, main generator engines and pumping engines. Built-in speed detection that accurately estimates starter disconnect speed, rated speed and overspeed. Modular design, self extinguishing ABS plastic enclosure and embedded installation way; small size and compact structure with easy mounting.